Unfortunately, I must begin this post with some horrible news. Friday night during the welcome party and moderator meet-and-greet in the America’s Center, a woman collapsed about 50 feet from the moderator booths. Synod Treasurer Chantal Atnip’s husband and daughter are doctors and rushed to the scene to assist the woman. They were able to keep her stable and were prepared to do some intense medical procedures had they felt they needed to prior to the arrival of paramedics. Saturday evening during the moderator election it was announced that the woman had passed away. I didn’t realize until this morning that the announcement Saturday night was related to the person who had collapsed not far from where I was standing Friday night. 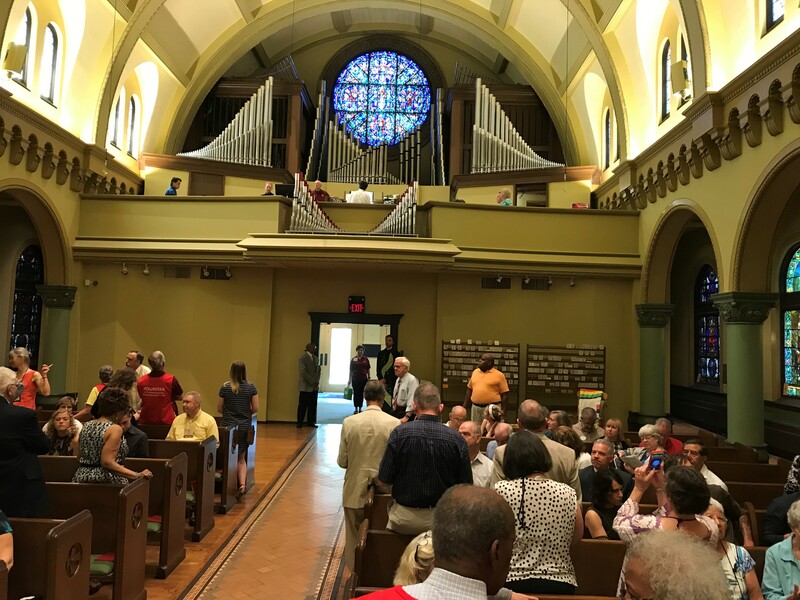 She was from the National Capital Presbytery, which consists of areas in Virginia, Maryland and Washington D.C.
Sunday morning, Synod Transitional Executive Sue Wonderland and I decided to go rogue and find our own Presbyterian worship service to attend. I had signed up for one that included shuttle service from my hotel, but we instead decided to find our own transportation so that we could get back early and explore the city before the afternoon plenary session. 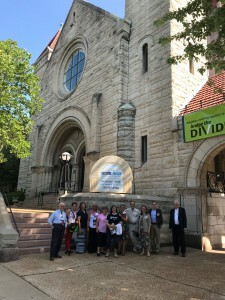 We ended up adding two more to our party (Sue Washburn of the Presbytery of Redstone and Valerie Young, the stated clerk of the Synod of the Sun), both of whom also liked our plan. We arrived before the bus from the hotels and were greeted warmly by a welcoming party. Pastor Travis Winckler, a Princeton Theological Seminary grad, led us in a short prayer circle on the church’s sidewalk prior to the start of worship. The beautiful building was quickly filled with Presbyterians attending GA, most likely doubling or tripling the average Sunday morning attendance there. The afternoon plenary session featured reports from the Way Forward Commission and All Agency Review, both of which were charged with “reviewing the service of the hole of the Presbyterian Church (U.S.A.) and its six agencies in implementing the General Assembly’s mission directives.” It was primarily an introductory session to get all GA commissioners on the same page as these reports are brought forth in the coming days. Being able to communicate effectively is among the things the two teams are hoping to improve. 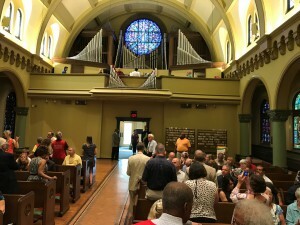 Applause was given when a comment was made that people have to Google information they are looking for on the PCUSA website instead of being able to navigate through the denomination’s complicated site. There was also a report from the Special Committee on Christian Education, which included Emily Chudy from the Presbytery of Donegal. The committee is looking to continue studying the certified Christian educator process and faith formation in racial ethnic minority and small congregations. 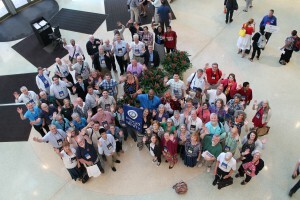 After plenary, we gathered all of those people who had traveled from the Synod of the Trinity for a group photo. It was so well attended that I had to go up one floor in order to get a good photo of all those who were in attendance. My evening activity I can sum up in one quick sentence: Cardinals 5, Cubs 0.